Your boss just called you to say that you’re stepping in for a crucial meeting in two hours. It’s unexpected but you’re still confident that you can handle it. One hour later, your mother calls you to take care of a bank emergency. A few minutes later, an email from your son’s day care teacher pops in and shares concerns about your child. The day goes on to get progressively worse. You get one bad news after the other and before you know it, you have a nagging headache, you feel the tension creeping in your neck and you already have the urge to either escape or punch the person nearest you. • Changes in your brain: Previous imaging and postmortem studies have reported a lower brain volume and a smaller size and density of neurons in the dorsolateral prefrontal cortex (dlPFC) of subjects with major depressive disorder (MDD). • Increased risk of heart attack: St. Luke’s Mid America Heart Institute revealed that those suffering from chronic stress are at greater risk of developing heart problems. Stress is also linked with a 42 percent higher risk of dying two years after a heart attack. • Depression: Some stress can keep you motivated and alert, although researchers from the US National Institute on Mental Health found that chronic stress could lead to depression in sensitive people. So how do you help your body cope with stress and improve your health? “Well, the road to good health starts with a positive mindset and the determination to make better life choices,” notes Dian Yu, Product Manager of Enercal Plus, an adult nutritional supplement made by Wyeth. • Do your lifts and push-ups. Or at the very least, make sure that you have some form of physical activity or exercise. An ideal time frame is 30 minutes, for at least three times in a week. • Reduce your caffeine and sugar intake. We know that nothing beats a sugar or caffeine rush; but be mindful of the fact that the “highs” that they provide often end with a sudden crash in mood and energy. • Say no to drugs, alcohol and cigarettes. All these may provide an easy escape from stressors; but the respite they give is at best, temporary and at its worst, ultimately debilitating. Always remember that it’s always best to deal with everyday life with a clear mind. • Eat healthy! Start the day right by eating breakfast (don’t skip it!) and keep your energy up throughout the day by eating nutritious meals. Remember that the key word to eating healthy is “balance” – too much or too little of anything can be bad for your health. Drink a glass of Enercal Plus to help make sure that you get the nutrition that your body needs. 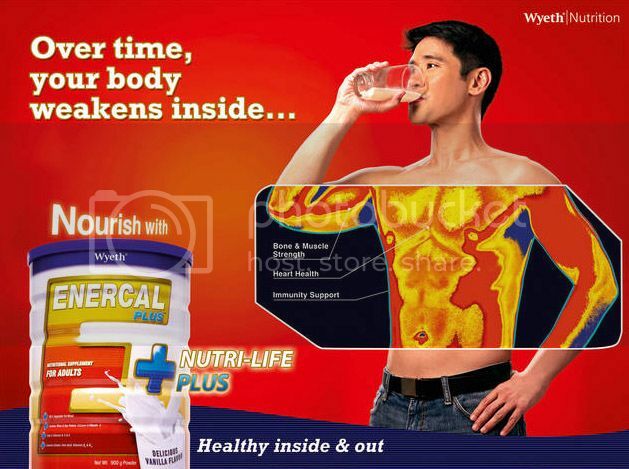 Enercal Plus, a product developed by Wyeth Nutrition Philippines, contains Nutri-Life Plus, which is a balanced source of 28 essential nutrients for immunity, strength, and heart health. It contains whey and soy protein that is a good source of amino acids needed by the body, which is easily absorbed to support muscle synthesis. Enercal Plus also contains vitamins A, C, and E to support the immune system, calcium and vitamin D for bone strength, and has 0g transfat for a healthy heart. So listen to your body and do not ignore its cry for help! Start on ways to improve your health right now!